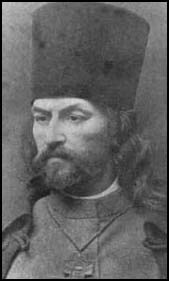 About 200 people died and 800 were wounded during the march led by Father George Gapon on January 22nd, 1905. That Sunday morning in St Petersburg (it was January 9th, Old Style), some 150,000 people gathered at the six designated assembly points to converge on the Winter Palace and present a petition to the Tsar, Nicholas II, who as the ‘little father’ of his people would surely be bound to sympathise with them. The march was organised by an Orthodox priest, Father George Gapon, head of the Assembly of Russian Factory and Mill Workers, one of several trade unions set up the previous year with the approval of the ministry of the interior to be a safety valve for grievances and to promote loyalty to the regime. Gapon, however, alarmed the authorities by his socialist attitude and took advice from the Union of Liberation, an organisation of middle-class liberal intellectuals campaigning for parliamentary democracy. At the beginning of January, when four of his members were sacked from their jobs, he started a strike which spread rapidly until 120,000 workers were out. Dressed in their Sunday best, with the women and children at the front, the marchers carried icons, crosses or pictures of the Tsar. They sang hymns as if in a religious procession and the less optimistic of them had prepared themselves for martyrdom. Their petition, inspired by the Union of Liberation, asked for the working day to be cut to eight hours, for the right to strike and for the election of a constituent assembly by secret ballot and universal suffrage. They never reached the Winter Palace, where Nicholas was in any case not in residence. Not thinking the situation was seriously threatening, he had gone off to the country. His ministers meanwhile had decided to block the march short of the Winter Palace. Thousands of armed troops were stationed at key points, but there was not expected to be any need for force. When the advancing columns appeared, however, while some of the soldiers fired warning shots into the air, some panicked and fired straight into the packed crowds. At the Narva Gate, where Father Gapon himself led the marchers, forty people were shot dead and the horrified Gapon cried out, ‘There is no God anymore, there is no Tsar’. At the Troitsky Bridge, marchers were charged and slashed with sabres by Cossack cavalry and on the Nevsky Prospect cannon were used against the crowd. The day’s total death toll is put at about 200 with some 800 more wounded. If anything was needed to undermine common people’s allegiance to the Tsar, this was it. Gapon prudently retreated abroad, while a wave of protests and strikes across the country built up into a full-blown revolution which presently forced Nicholas II to issue the October Manifesto, promising to introduce democracy. Gapon returned and was murdered by a government agent. The manifesto had drawn the revolutionary movement’s teeth, for the time being.